November continues to be far busier than we’d like. Long overdue appointments, the start of Christmas shopping (I know, I know, but we like photo gifts made by Shutterfly, and shipping them up here to Canada from the States requires a little planning), writing assignments, our own Dire Rugrat projects we want to wrap up, and…. 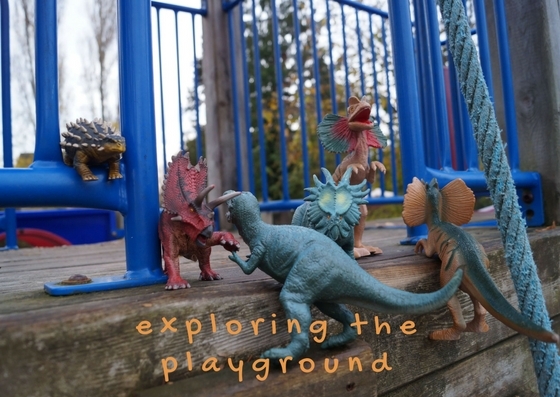 DINOVEMBER! After doing this for a few years, the dinosaurs seem to run out of inspiration and once in awhile the rugrats tell us the dinosaurs are doing something they have already done. Repetition is bad. When you wait all year for remarkable magic, each and every day needs to be brilliant. Apparently. I imagine the dinosaurs are exhausted with this sort of pressure (I know I am). And the early morning hunts for what the dinosaurs did last night doesn’t make it any easier. 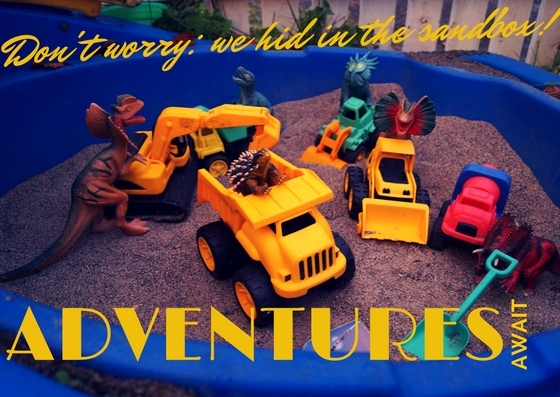 In the hopes of preventing the rugrats from waking up at an ungodly time hunting down the dinosaurs to see what sort of shenanigans they are up to freeing up a bit of time, we packed up the dinosaurs. That’s right, no more adventures. This didn’t come out of nowhere. No, no. The dinosaurs deserved it after the stunt they pulled. Well, it wasn’t exactly their fault. Desperate for a reprieve, I picked up a package of mini cupcakes at the store, and then, before bed, whispered in Rugrat #3’s ear about a dinosaurs party. 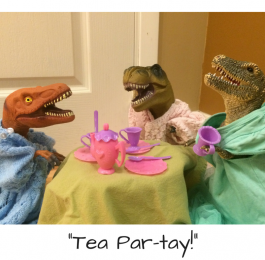 She took off chanting “dino party” and her older brothers accepted it as her idea. 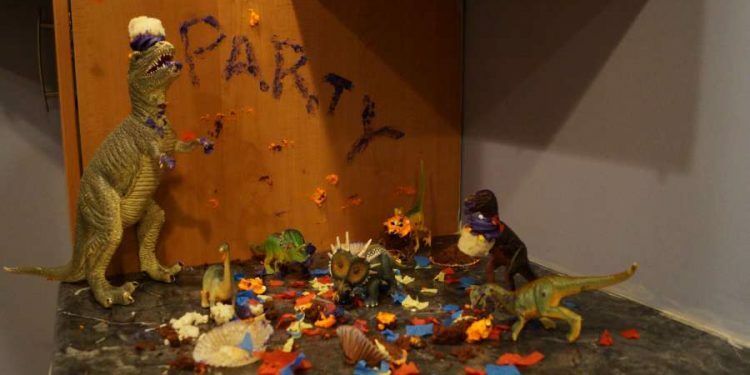 The next morning they found the remnants of a dinosaur party. 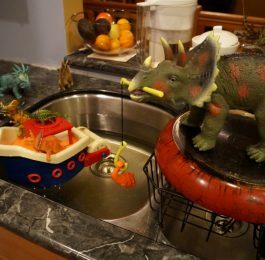 The cupcakes were gone by the time I dragged my tired self out of bed and, since I said the night before that a big mess meant a Dinovember-break, the kids knew what was coming. Except a handful of them escaped. And then went on an adventure outside the walls of our house. 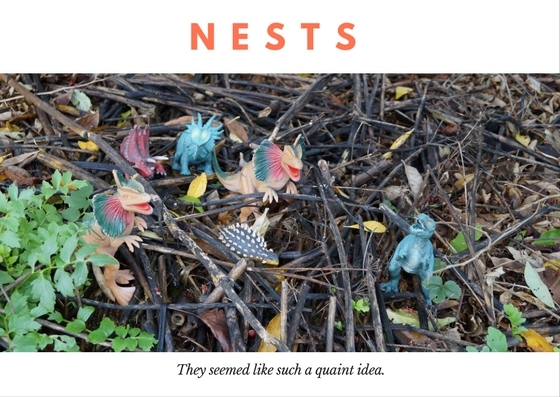 After all, why dash our children’s happy little dinodreams when the magic of the internet can allow those dinosaurs to send pictures to our adorable kiddos? And all after 7 am. Rugrat#2 was curious. It could come from his own love of wandering off to be unsupervised, I’m not sure. For one week, the kids were sent these pictures by those magical reptilian beasts. The rugrats diligently checked the areas where the photos were taken, sure they might be able to catch up with the dinosaurs. Rugrat #1 suggested the dinosaurs could see what we were doing but were staying hidden. Or were invisible. 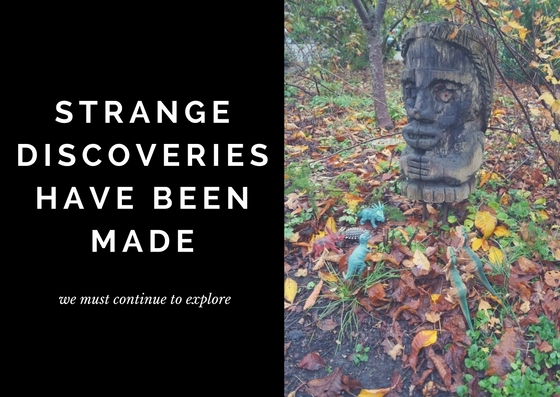 I will say was impressed with his ability to locate the areas in our neighbourhood with just a snapshot. Rugrat #2 continued to be thrilled with the whole experience, but at four years old, I think he liked that a) his brother didn’t discover what the dinosaurs did last night any sooner than he did, and b) he got to look at the computer to see the pictures. Rugrat #1 continued to be frustrated. He loved determining where the pictures were taken, and he loved seeing the photos, but a few minutes after their reveal he would get upset the dinosaurs hadn’t returned. Rugrat #3 definitely just loved the computer (screen time is pretty limited in our house). 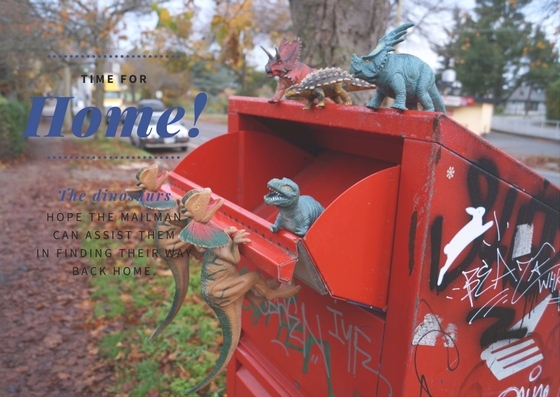 Rest assured the dinosaurs are back in action and, after a little break, Ken and I are feeling a little more ready for some dinoantics. Plus, these prehistoric reptiles found the photobook of their dinofun from 2015 in the mail, so they brought that home with them. 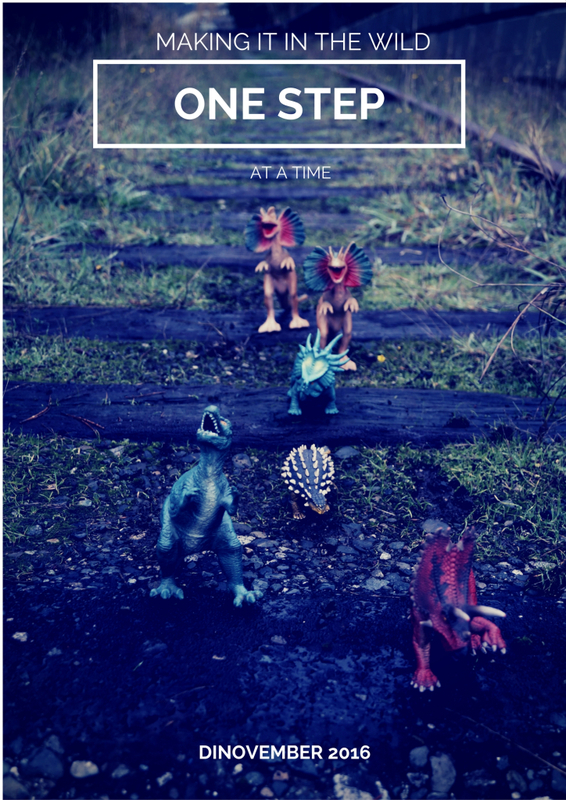 Have you tried Dinovember yet? Share your ideas! 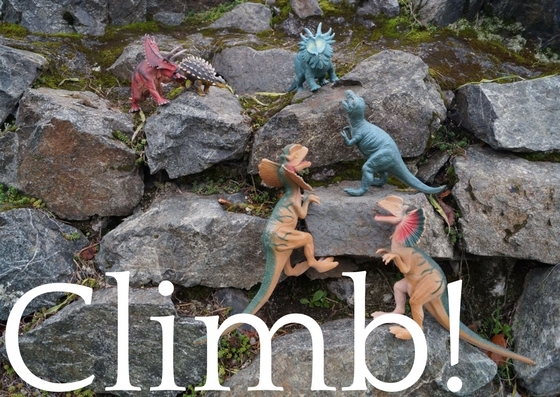 Our dinosaurs can always use a little inspiration.